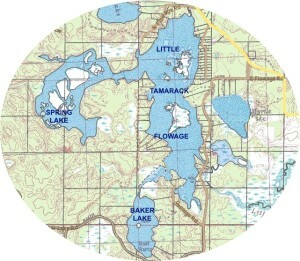 The Little Tamarack Flowage is located in the Town of Conover in Vilas County, Wisconsin. It includes Baker and Spring Lakes and connecting bogs, wetlands, and waterways – a total of approximately 370 acres. The Flowage was created in the 1940’s, providing recreational opportunity to the public on its waters, wetlands, and shorelines. Panfish, bass, northern pike, and muskies abound. Ice-fishing for perch is great in the winter. Canoeing and kayaking are popular, since the Flowage provides many interesting channels and backwaters for the nature-lover. Flora and fauna are of the wetland varieties, and many rare species are at home on the Flowage. There are two public boat landings providing access, and one-third of the shoreline is undeveloped Vilas County Forestland. The Little Tamarack Flowage flows into Little Tamarack Creek, which meets Tamarack Creek; together they become a tributary of the Wisconsin River near its headwaters. A lake association – the Flowage Preservation Alliance – was formed in 2011 to address the fact that the old dam from the 1940’s was not permitted, had no owner, and might be unsafe. Members included area residents, second-home owners, fishermen, canoe-ists, kayakers, naturalists, and local merchants, who all have a stake in keeping the Flowage intact. Education, fund-raising, and partnering with governmental agencies made it possible to find a long-range solution. Through the efforts of the “Alliance”, the Little Tamarack Flowage Baker Spring Lake Protection and Rehabilitation District was formed in 2014. As a municipality and a taxing authority, the Lake District assumed ownership and responsibility for the dam, its reconstruction, and maintenance. Property owners around the Flowage support the efforts through their property taxes. Reconstruction of the dam took place in 2016, and will assure the long-term survival of the Flowage and its connecting waterways. The Flowage Preservation Alliance was dissolved in 2017, having accomplished its goals, including forming the Lake District, which will carry on.